Jake Needham's character Jack Shepherd is a lawyer and fixer whose specialty is money: not so much making it for himself as tracing it for his clients. His exploits have taken the reader from Thailand to Hong Kong and Washington DC and now to the tiny strange district of Macau. The Shepherd stories are mostly told in his voice, and he's an interesting guy to listen to--entertaining in the story and the way the story is told. 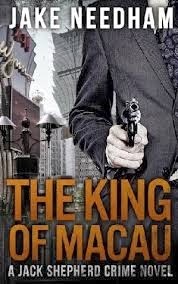 In The King of Macau, there are also a few chapters from the point of view of another mysterious character who is pleading for Jack to help him achieve asylum in the U.S. (and it would be a spoiler to let you know who he is, even what his nationality is). Simultaneously with Jack's growing sense of responsibility for this mystery man, he's also pursuing the investigation that brought him from his (now) home base in Hong Kong to the neighboriing international zone of Macau, like Hong Kong a former European colony (of Portugal) subsumed under Chinese rule, but unlike Hong Kong Macau is all about gambling. The so-called "king of macau" formerly controlled the whole gambling enterprise in the city, but has now been at least partially pushed aside by the larger gambling interests invited by the new Chinese rulers. And the King's daughter, not trying to inherit her father's empire but simply to run her own casino, wants Jack to find out who is bringing large amounts of cash into the casino, and why. Jack assumes that it's the Triads, still powerful in the new China and its territories, and if that' s the case he wants nothing to do with the investigation. Among those persuading him to take the case is an American FBI agent (maybe, anyway), and among those Jack enlists to help is another face we've seen before in this series, a shady Australian who may once have been a spy and may still be (for someone). All of the intrigue revolves around the circulation of money: Needham's stories (particularly in this case) prove that it doesn't have to be the body count that propels a crime novel. Money in large amounts has its own aura of power, threat, and fascination, and its movement through casinos, banks, gangs, and private hands is Jack's expertise and the motor of the series based on him. Like a brand new banknote, the stories are crisp and colorful engines. And, as in the other Shepherd books, the locations (here Hong Kong as well as Macau) are an essential part of the story. The history and current state of Macau is a little known (to we in the West anyway) tale but one with overtones of crime, greed, and compulsion that we recognize from all crime stories--but with the added interest of the new audience for the gambling floors of Macau: the citizens of the new China's new capitalism (or at least the newly released hounds of the nation's drive for wealth and cash).